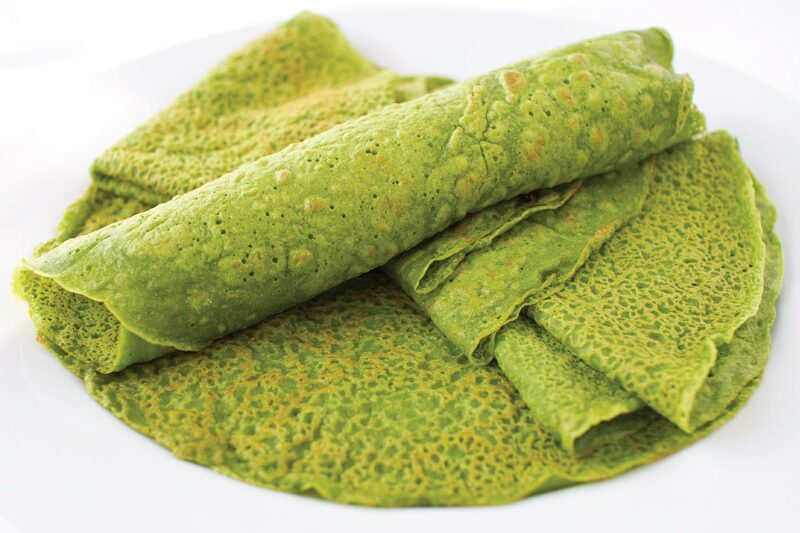 Light Spinach Crepes – Ornish Lifestyle Medicine™ Approved! Combine spinach, milk, salt, yeast and nutmeg in a blender. On a very low speed, gradually blend in flour. Pour the green batter into a bowl and whisk in milk or flour to adjust the consistency to a texture similar to buttermilk. Cook crepes over medium heat in a nonstick sauté pan with 8 inches of flat surface. For the first crepe allow the pan to heat up until you can hear a sizzle when a small splatter of batter hits the surface of the pan. Use a 2 oz ladle or a ¼ cup measure to pour the batter into a tilted pan and swirl to cover the bottom of your pan. When the edges of the crepe have browned and turned up away from the pan, the crepe is ready to turn. Use a soft spatula or both hands gently grasping the edge of the crepe to turn it over. Both sides of the crepe should be lightly browned to insure that it is fully cooked.